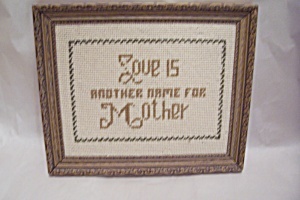 Nice needlecraft tribute to Mother titled "Love Is Another Name For Mother" in a nice frame. 7-1/2" by 9-1/2" and overall framed is 9-3/4" by 11-3/4". Fine condition. 1970s.